I was a navigator at McGuire from 76-80 and would love to see the “real” 141 one more time. My wife and I are interested in attending Open Cockpit Day on the 20th. I’m an Air Force vet who served during the Korean War, but have no health problems. Any chance we can join you on the 20th? Open Cockpit Day is free and available for any and all to come and enjoy the event! Dover Air Fore Base Museum is a real gem. Our friends from NJ & my wife & I enjoyed a wonderful day. The staff was friendly & very informative. The former crew men gave us a history lesson & the planes were fabulous. They are true heroes & made me proud to be an American. 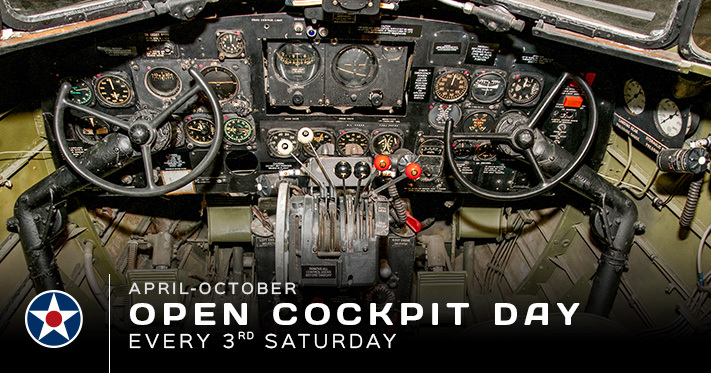 Hi, I am curious as to what weather conditions must be present for open cockpit day to occur, as I am planning on stopping by this Saturday. For our outside aircraft, typically weather that’s comfortable for our tour guides to work in. This being below 90° (which is when our aircraft are closed, as it becomes 104° or higher inside) and sprinkling. My wife & I spent about 6 hrs over 2 days at the museum last summer and loved every minute. The guides were excellent and the facility was very accessible. Besides the outstanding aircraft to see and explorer, we especially remember the Medal of Honor passageway. I am USN (Ret) and I work with the Boy Scouts here in central Pennsylvania. Currently our Venture Crew is setting up to visit. They will have a blast! Just wondering if the C-141A is open on Open Cockpit Day? I think I read somewhere only the B model was open. Flew out of Dover with the 20 MAS for several years…1969 – 1971. The C-141A is not opened during Open Cockpit Day. The C-141B is always open for self-guided tours, as long as the weather cooperates, and it is wheelchair accessible. As a former Aircraft Instrument, Autopilot and Navigation repairmen (42250) I read some comments requesting to see aircraft not on the Open Cockpit list. Why not photograph all the restored aircraft cockpits and post them on this website. It would be a popular web page to visit especially by those visitors who may be disabled or unable to enter cockpits of these historic planes. I was fortunate being in a career field that assigned me to work on many types of aircraft in the USAF inventory. At Dover I was every day or night in and out of C124s and C133s. The ladder climb to a C124 cockpit is a challenge, dangerous and restricted or prohibited . Visitors should be able to see the business office of these aircraft where our flying crews flew these aircraft. We’re currently updating our aircraft photos and are in the process of reuploading several of our other photos, including restoration process pictures. Please stay tuned. My son and I recently visited The Air mobility Command Museum. We found it very interesting. The history was fascinating and to see the planes in person really added to the experience. The volunteers were very helpful and informative. I would recommend this museum to anyone especially if you are an American. It is something to be proud of. Dover AFB has both C-5M Super Galaxies and C-17 Globemaster IIIs stationed here. Unfortunately, due to these being military aircraft it’s hard to know the frequency at which they’ll come and go.